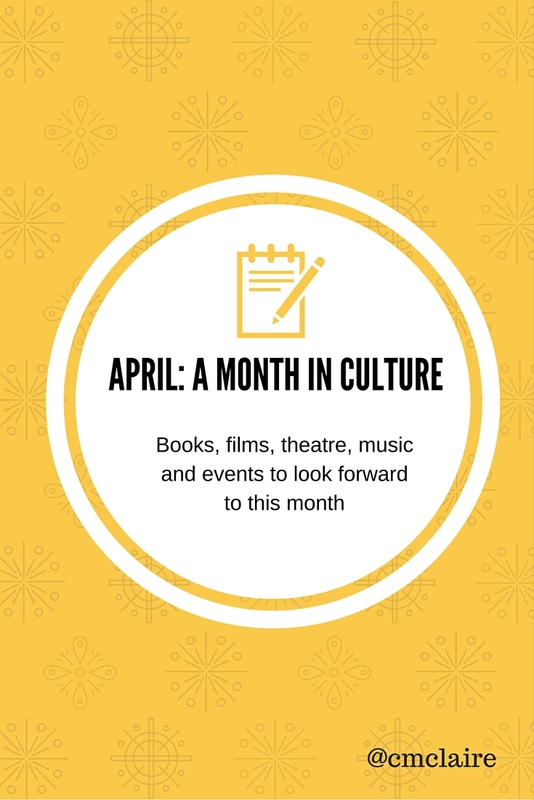 Another month, another wealth of cultural highlights to enjoy! The big release this week is Eddie the Eagle, which looks really sweet and funny, in a Billy Elliot / The Full Monty groove. I’m really looking forward to it. On the eighth The Huntsman: Winter’s War and Midnight Special have their debuts. The 15th sees the release of the Helen Mirren starring Eye In The Sky and the much anticipated live-action version of The Jungle Book. The 22nd has openings for Bastille Day, Desert Dancer, Jane Got A Gun, and Whiskey Tango Foxtrot (Tina Fey fan that I am, I cannot wait for this one. And trailers which utilise Missy Elliot are always fine by me). The end of the month sees Captain America: Civil War, Demolition, and Son of Saul, this year’s foreign-language Oscar winner. It’s definitely a mixed bag of films this month! Please note in the books section links are amazon affiliate links. Other links, and other book suppliers, are available. I like to be transparent on these things! On the 1st, Mary Beard’s Roman history, SPQR, is released – I am so excited to read up on this fascinating era, which I haven’t really studied in depth since primary school. Ready Steady Glow (releasing April 7th), the sophomore offering from Madeleine Shaw, looks full of lovely, healthy foods and lifestyle tips. I’m in the market for a few new cookbooks so this may be a purchase! The 7th also sees the paperback release of Bill Bryson’s The Road to Little Dribbling – I adore his travel writing so will definitely be seeking this out. Also releasing on the 7th and incredibly different it Irvine Welsh’s latest novel, The Blade Artist, which looks like a gripping, shocking read. April 14th sees the launch of a new edition of Scotland the Best – I love these guides and frequently gift them to friends holidaying in the bonny land; I’m excited to see what new attractions may have made the cut! On April 21st, Career of Evil, the third of J.K. Rowling’s Robert Galbraith crime novels launches, following the travails of Robin and Strike. I haven’t tried these books yet, but have added it to my list; curiosity always gets the better of me! On April 1st Glenn Close will be making her West End debut in the ENO’s semi-staged version of Sunset Boulevard (Coliseum). Shona and I have tickets for her final evening show in May and cannot wait – Close’s Norma Desmond is the recording I grew up listening to, so I’ll be ready to fangirl! From April 9th Game of Thrones’ Kit Harrington will be starring in the Jamie Lloyd Company production of Doctor Faustus (Duke of York’s). The 9th also marks the transfer of Funny Girl to the Savoy; I am so excited to see Sheridan Smith as Fanny Brice. Another opening on the 9th is Show Boat (New London Theatre) – I’ve never actually seen this particualr musical so may have to seek it out! On the 13th the Pulitzer-prize-winning The Flick opens at the National, and I’ll be seeking out some day tickets because it sounds wonderful! April 30th sees the debut of A Midsummer Night’s Dream at Shakespeare’s Globe, Emma Rice’s first production at the venue. I’m excited to see what she does with the Bard’s magical comedy. Muse are playing the o2 for five dates at the start of the month, and Adele has two more evening shows there too (the lady will have played eight nights in total!). Later in the month Ryan Lewis and Macklemore will be playing at the Greenwich megadome. On the 10th the Royal Albert Hall plays host to the imagiNATIONS concert, performed by the National Youth Choirs of Great Britain. Later in the month the RAH will be the venue for several concerts in aid of the Teenage Cancer trust, featuring a wide range of artists, from New Order to the Vaccines. So that’s some of what I’m looking forward to this month. How about you?